NEW Rangers captain Lee Wallace has thanked the Ibrox support after they pushed season ticket sales beyond the 33,000 barrier. 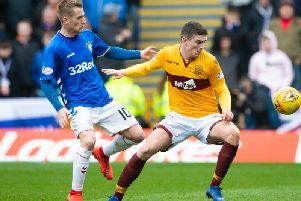 Manager Mark Warburton officially announced Wallace would be taking the armband permanently ahead of Sunday’s 5-1 victory over Alloa - the Light Blues’ fourth win in a row this season - and the defender has heaped praised on the fans who have bought into Dave King’s Rangers revival. Wallace said: “To reach 33,000 season tickets after the problems supporters have had to endure in recent years is incredible and I can’t thank them enough for their backing. “There is a long way to go but we have made a positive start to the season and we will only get better as we are a new team. “The atmosphere at the recent St Mirren game at Ibrox was terrific and it was great to see the stadium full once again. “That level of support will never be taken for granted and we are all looking forward to playing in front of another packed crowd when Hibernian visit on Sunday afternoon. “It is a huge honour for me to be Rangers captain and it is all the more special when you run out of that tunnel with the roar of the supporters inside Ibrox.